Smooth caramels get a double dose of orange flavor from orange juice concentrate and candied orange peel. I love these dipped in chocolate, but you can omit that step if you’re short on time or prefer your caramels less embellished. The candied orange peel in this recipe is optional, but it adds a nice texture and an extra citrus boost to the caramels. If you want to use it, you can either make your own using this recipe for candied peel, or buy it from well-stocked grocery stores or baking supply stores. In a medium saucepan, combine the sugar, salt, corn syrup, and orange juice concentrate. Bring the mixture to a boil, stirring constantly. Once boiling, insert a candy thermometer and continue to boil the candy, stirring occasionally, until it reaches 230. Add the softened butter and the cream gradually, so that the boiling does not stop, and continue to stir occasionally. Continue cooking the candy until it reaches 245 degrees. Once the correct temperature is reached, remove the pan from the heat and stir in the chopped orange peel. Once the candy is well-combined, pour the caramel into the prepared pan. 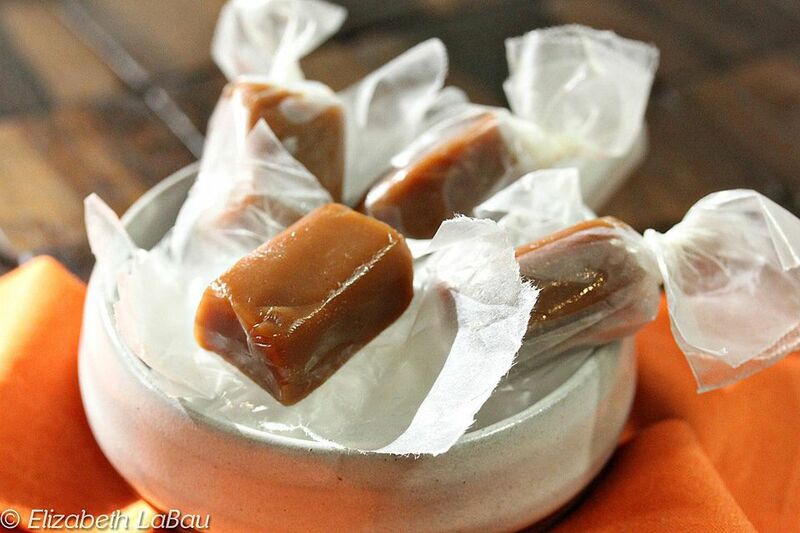 Allow the caramels to set at room temperature for several hours, or overnight. Once set, cut the caramels into small squares. If you are omitting the chocolate step, they can be served immediately, or wrapped individually in waxed paper or cellophane to store or give as gifts. To dip the caramels in chocolate, place the chocolate in a large microwave-safe bowl. Microwave to melt the chocolate, stirring after every minute to prevent scorching. Allow the chocolate to cool slightly, then dip individual pieces into the chocolate using dipping tools or two forks. While the chocolate is still wet, place a sliver of candied orange peel on the top as a decoration. Place the dipped pieces on a foil-lined baking sheet, and allow them to set in the refrigerator. Store chocolate-dipped caramels in an airtight container in the refrigerator. Click Here to View All Caramel Recipes! Click Here to View the Top 10 Citrus Recipes!